OK, I overreacted to one game. I should have known that Syracuse’s offensive woes wouldn’t disappear so swiftly. SU coach Jim Boeheim warned people not to make too much of what happens before the NCAA tourney. Now we know you can overreact to what takes place in the opener of the NCAAs, too. Critics had supposedly underestimated the Orange after they staggered to five losses in their last seven games before the Big Dance. Then a lot of the same experts oversold SU after it blew out Western Michigan in the first game. Suddenly, Dayton had become the easy target. People moved the Orange right through their bracket to the Sweet 16. Jerami Grant was healthy, right? Trevor Cooney’s shot was back. 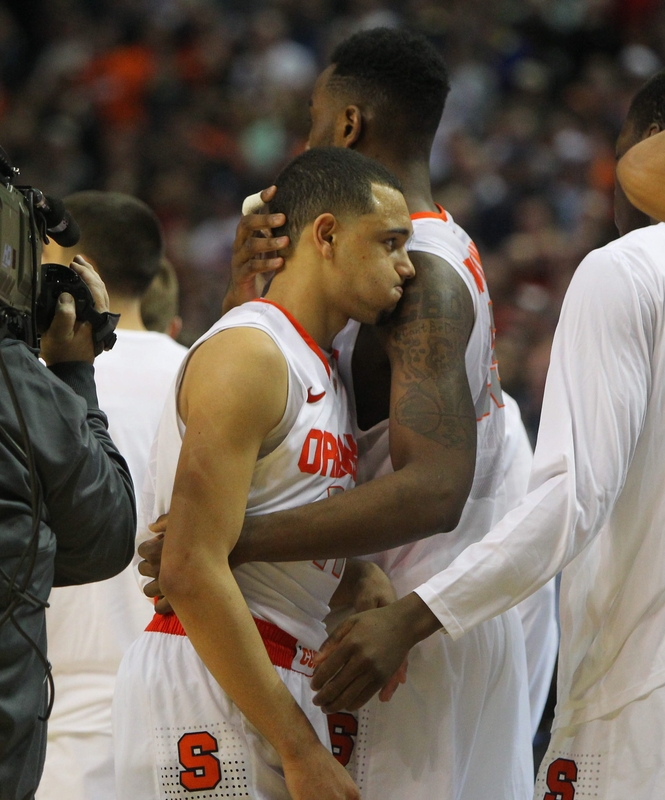 The unbeaten Syracuse team had returned, just in time. Then a funny thing happened on the way to Memphis. Like an untimely spring snowstorm, the bad SU offense arrived in Buffalo. Not the team that reached the top of the rankings early in the year, but the saps who forgot how to play offense down the stretch. Dayton, a determined and athletically capable foe, took the Orange completely out of their game Saturday night, holding them without a three-point basket to escape with a 55-53 victory and a spot in the Sweet 16. This was not a pretty contest to watch, even by Syracuse standards. The Orange had four points in the first 9:08. They had four assists. It was an unsightly mess, a breath of fresh airballs, a sorry affair that made the NCAA tourney seem like an overhyped spectacle, an artistic fraud. But somebody had to win it, and perhaps we should have seen this coming. When a team is struggling on offense, there’s a reason. Syracuse is not blessed with many great shooters. They struggled often during the season and scored more than 63 points once in a closing, 11-game stretch. On Saturday, before a howling, orange-clad crowd, we saw why. Syracuse does not have enough weapons. Their one pure outside threat, Trevor Cooney, was a non-factor with two points and no assists. “It’s very hard to win making layups, if that’s all you’re making against a good defensive team,” Boeheim said. Dayton gets a lot of credit. They played stifling defense, as they had against Ohio State. It makes it more difficult for shooters when defenders creep out a foot or two closer on the perimeter. Shooters hesitate, lose their sense of rhythm; they begin to anticipate the defender being there. This was not Western Michigan. On Friday, Boeheim talked about how great shooters don’t think much. They have no conscience. He could have been talking about Cooney, who seemed to lose his confidence late in the season. Cooney was lost. He missed all four of his three-pointers. A couple didn’t hit the rim. Fair performed bravely, but he had some unsightly misses, too. Grant, a presumed high NBA pick, had a curious game, shooting 2 for 3 for four points before fouling out. Still, it looked as if Syracuse might pull it out. Sometimes, a great team has to survive when its offense isn’t functioning and it has to rely on defense and guts. But the Orange were not a great team. Dayton isn’t either, but they were the tougher, smarter, more resilient group. Boeheim has to take his share of the blame. He lives and dies with the 2-3 zone, and it gave Dayton trouble. But the Flyers got the ball into the seams of the zone quite a bit. It might have helped if Boeheim had mixed it up some to create confusion. It was odd to see Tyler Ennis, the freshman point guard, shoot 7 for 21, while Grant was attempting only three shots. Ennis is a fine player. He kept Syracuse in the game. But how does Grant, a future pro, take three shots and only one free throw? College basketball has become a game of dribble-drive, with the rules making it impossible to stop guards driving to the basket. Like many coaches, Boeheim was content to sit back and let his point guard try to win the game on his own. It almost worked. Ennis, who scored 19 points, scored four in a row to get SU within a point, 54-53, with 16.2 seconds left. Syracuse trapped Dayton’s Jordan Sibert on the inbounds, forcing him to step out of bounds. Ennis dribbled to the top of the key and, rather than drive to the basket again, clanked a 16-footer off the side of the rim. The Orange had one last chance after Dyshawn Pierre sank one free throw, making it 55-53. Ennis missed a three-pointer at the buzzer and it was over. It was Syracuse’s 10th and final three-point attempt, its 10th miss. A fitting way to end a season that showed such promise and then disintegrated in a late-season flurry of missed shots and dubious offensive execution. This would have been Syracuse’s 120th victory in four years. Instead, it was a grim reflection of their troubles in February. We were told not to put too much stock in their late-season woes. The offense wouldn’t possibly be that bad in the tourney.